“That” was a cut soybean field, a 100-acre expanse with just a touch more cover available than the top of a pool table. 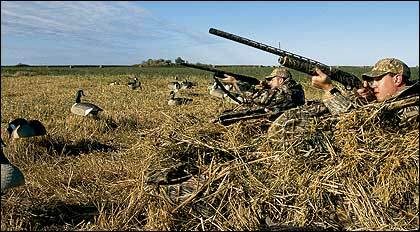 But a hundred or so Canadas had been hitting the field religiously for the past two mornings. “I hate to let ’em go unmolested,” said Fountain, leering out the passenger window at the birds. “Maybe those fancy new blinds of yours can get us out there?” I shook my head, uncertain. An hour and a half before sunrise the next morning found us on what we agreed would be the X. All around, scores of grayish-white feathers pointed toward an avian nirvana–if, that was, we could get hidden. After placing our eight full-body decoys, Fountain and I readied the low-profile blinds we’d packed in. Though the blinds had been muddied prior to the season, we began rubbing them liberally with handfuls of Iowa farm ground. Next, using what little bean chaff was available, we filled every other stubble strap, trying to soften any unnatural edges. Done, I stepped back to survey our handiwork. Fountain, I thought, was annoyed by my pessimism. Fifteen minutes into shooting time, the first black line of birds appeared over the river to the east. Beside me, Fountain wrist-jigged a T-Flag once, then again, until he was sure that the line had wavered and the birds’ attention was his. By the time the flock had hit Highway 1, my calling had backed down to quiet clucks and moans. Any minute now, those birds are gonna slide, I thought. Closer they came–150 yards, then 100, then 75. Instantly, drop-leg Canadas began to frantically backpedal, strong pinions whistling as they ripped into the cold November air. My first load of high-velocity BBs crumpled a huge bird on the far left edge of the flock, but who knows where round two went. Flustered, I punched the trigger as the barrel passed by a tail-end Charlie, and I smiled as I watched him fold. 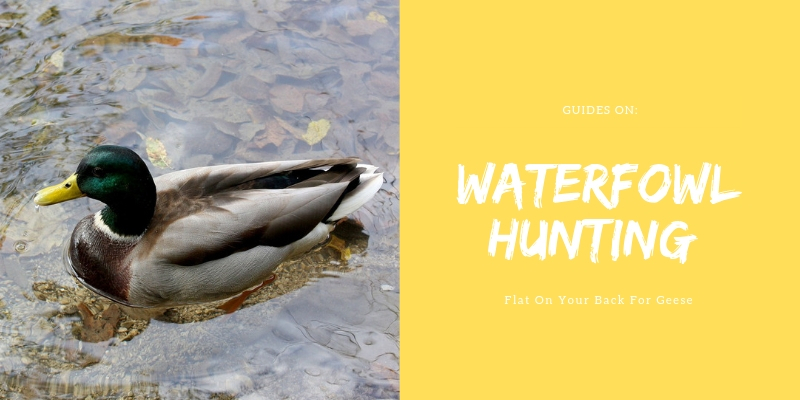 As far as I’m concerned, low-profile blinds–or layout blinds, as they’re often called–got their start the minute the first waterfowler laid himself down in a muddy field and covered up with whatever was at hand. It was a technique that worked, but it didn’t take long before hunters grew tired of lying on their backs in the mud. There had to be a way, many thought, to retain this low-profile characteristic while staying–heaven forbid–comfortable and dry. 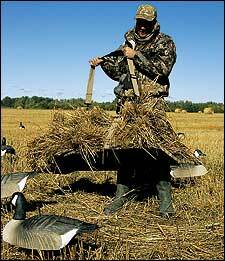 A good blind is one that’s easy to carry into the field. With a little practice, most can be set up in just a few seconds. Ron Latschaw was one of the many. An Oregon native, Latschaw was accustomed to spending his time carving holes out of the soggy soil of the Pacific Northwest and then lying in them. Yes, he and his partners killed geese, but he’ll be the first to tell you all that digging and filling got old in a hurry. And then there were the fields that were full of geese that the landowner was more than happy to give Latschaw and his crew permission to hunt, with one major stipulation: no digging. Fence lines and above-ground box blinds worked for a while, but the geese soon grew wary of these. Not willing to give up, Latschaw created the Adam and Eve of the low-profile blind revolution. At first, these prototypes, though effective, were big and heavy. Plywood construction contributed to the weight, and all the unnatural straight edges and corners made the blinds stand out too much in the field. Over time, plywood gave way to rugged Cordura nylon and a lightweight frame of tubular steel, and then aluminum. In 1993, the modern low-profile layout blind was finally born and Latschaw’s flagship creation–the Eliminator by Final Approach–was introduced to the waterfowling community. Today, Latschaw’s blinds and others like them have become mainstays among the nation’s duck and goose hunters. Why do these low-profile blinds work? For insight, I asked three-time Tennessee state duck calling champ Bill Cooksey, who is also the public relations frontman for Memphis-based Avery Outdoors. Cooksey spends a lot of time hunkered down in modern low-profile blinds from September through January. As a result, he’s come to know what makes these blinds so productive. In certain circles, it’s said that waterfowl, though having extraordinary vision, possess little or no depth perception. The result is that, to a goose, the hump on the ground that is the low-profile blind appears as a two-dimensional spot of nothingness. True, or false? All low-profile blinds angle toward the ground, especially in the front, which is the direction you’ll typically have birds approaching from. From the rear, blinds often have a boxy shape to them due to their square backs. This shape is a dead giveaway to birds that the spot they see on the ground is not natural. But the slope built in the front of the blind helps it blend into the surrounding area. One thing that can nullify this natural camouflaging effect is the presence of shadows. Today, waterfowlers have many different brands of blinds to choose from, and Cooksey lays out the four most important factors to consider when selecting one. “First,” he says, “a layout blind must be easy for someone to get to the spot that they want to hunt. Second, it has to have a profile that eliminates shadows. Third, it has to be comfortable enough that you can sit in it without moving around a lot. Of course, there’s more to using these blinds than just pulling them out of the box and plopping them in a field. For starters, Cooksey says hunters shouldn’t make the mistake of trying to set up the blind for the first time on the morning of the hunt. Most layout blinds are easy to assemble and set up, but, “if the first time you’re trying to do this, it’s in the dark and 18 degrees, it’s going to take a while,” he says. A better plan is to get in some practice with your blind in the off-season–even if it’s just sitting in your living room with an unloaded gun. Taking your blind outside and shooting clays from it is even better. Preparing the blind for the field is important, too. Today, camouflage has progressed to the point where many hunters no longer lay their shotguns down afield for fear of losing them. And while the same could be said about today’s layout blinds–all of which feature the latest in photo-realistic camouflage–there is a little bit more to the invisibility process than simply heaving the blind into the stubble. Doing this will take away any unnatural sheen produced by the blind’s fabric. Over the past five or so waterfowl seasons, I’ve begun to discover that there is indeed a science to using these low-profile blinds effectively. How the blinds are set up when gunning with multiple shooters, how to position the blinds in relationship to decoys, and how to use additional camouflage in the field can all make or break a hunting day, depending on the weather and other factors. Hunters such as Latschaw and Ohio calling legend Fred Zink have discovered many of these techniques through trial and error. For instance, on those mornings when there’s little or no wind, Zink has a special strategy for positioning his low-profile blinds and decoys. Such days are notoriously tough and often downright frustrating, says Zink, as geese can approach a spread from any direction. This means using fewer decoys for big Canadas and more for the smaller subspecies such as cacklers, Hutchinson’s and lesser Canadas. Zink sets these decoys 10 to 15 yards in front of the blinds, sometimes a little to one side or the other, depending on the birds’ most likely angle of approach. Key to Zink’s technique is to do a very good job of camouflaging his blinds. Unfortunately, some folks take this to mean covering their blind so as to create something about the size and shape of a 1,000-pound round bale. This defeats the purpose of the low-profile blind. Low-profile or layout blinds have become a cornerstone of many waterfowlers’ hunting strategies for one reason: They really work. With very few exceptions, layout blinds used in situations with multiple hunters are generally arranged in a line, facing downwind, and are located in the lower third of the decoy spread. But here, too, there are factors to consider. And nobody, Cooksey adds, wants to be screaming when the honkers are bowed up at 150 yards and the guy to your right is asleep, snoring loud enough to wake the proverbial dead. Which, points out perhaps the biggest challenge to being flat on your back in a layout blind: It can get just a little too comfortable.